DSG Technology/PNW Arms Super-Sniper Ammunition (SSA) Enhanced-Range Rifle Ammo Being Made in the USA for Military Special Operations Forces (SOF) Long-Range-Interdiction/Sniping and Close Quarters Battle/Close Quarters Combat (CQB/CQC) Applications: Solid-Copper Super Sniper Tactical (SST) Rounds/Bullets and Tungsten-Tipped Super Sniper Armor-Piercing/Armor-Penatrating (SSAP) AP Rounds/Bullets in All Military NATO Calibers! (Video!) | DefenseReview.com (DR): An online tactical technology and military defense technology magazine with particular focus on the latest and greatest tactical firearms news (tactical gun news), tactical gear news and tactical shooting news. In case revolutionary sub-aqua/underwater rifle ammo isn't enough for you, the DSG Technology and PNW Arms "fused project" has also developed two new long-range-interdiction/sniping / CQB/CQC (Close Quarters Battle/Close Quarters Combat) rounds under the Super-Sniper Ammunition (SSA) moniker right here in the USA, specifically in Idaho. The first is a solid-copper monolithic round called the Super Sniper Tactical (SST) round. The second is a tungsten-tipped/brass-rear armor-piercing/armor-penetrating round called the Super Sniper Armor-Piercing/Armor-Penetrating (SSAP) round. 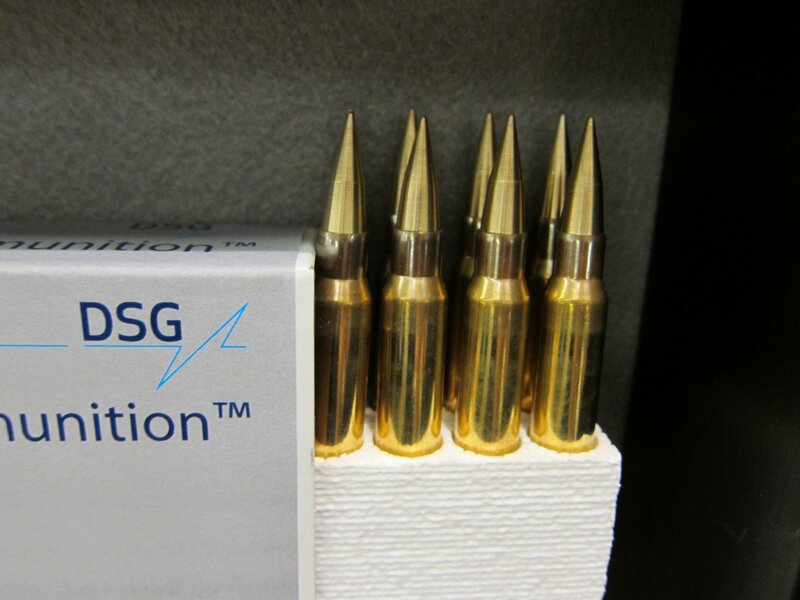 Like the DSG/PNW MEA (Multi-Environment Ammunition) sub-aqua/underwater rifle ammo, the new DSG/PNW SSA rounds will be manufactured in 5.56mm NATO (5.56x45mm NATO), 7.62mm NATO (7.62x51mm NATO), .338 Lapua Magnum, and .50 BMG (12.7x99mm NATO). DefenseReview initially discovered and photographed the DSG/PNW SSA rifle ammo (SST and SSAP rounds) at NDIA Infantry Small Arms Systems Symposium 2011, but Mark Baciak of PNW Arms and Richard Morgan of DSG Technology also had some of the new sniper ammo at NDIA Joint Armaments Conference 2012 a few weeks ago (. 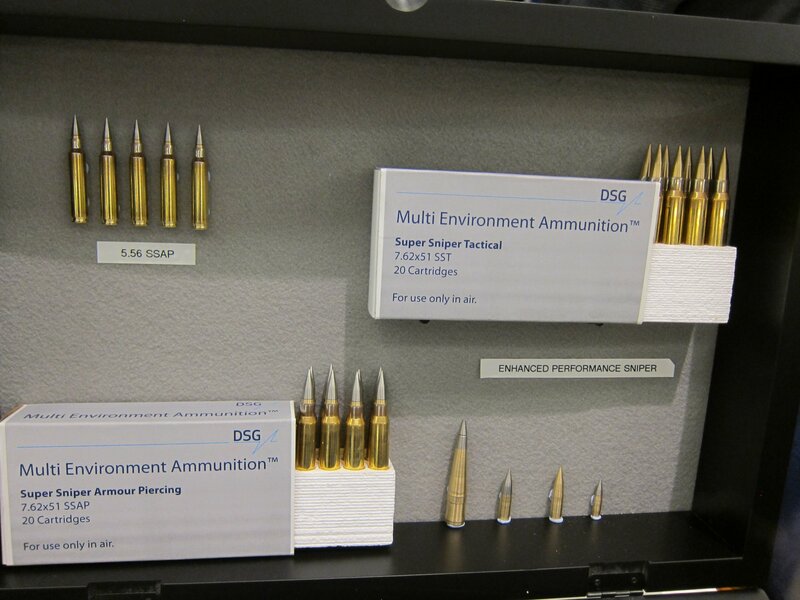 The DSG/PNW SSA ammo's primary claim to fame is it's enhanced-range (or range-enhanced) capability. For example, the 7.62mm NATO variant SSA ammo can, according to Baciak, actually out-distance/out-perform convential .300 Win. Mag. rounds, which is impressive. "It's a boattail round. It uses what looks like a conventional design, but if you look closely, it's actually a vectored design. It's got low drag, it's got exceptional accuracy, particularly in crosswinds, and it goes 25% [farther] than a conventional round out of the same weapon. 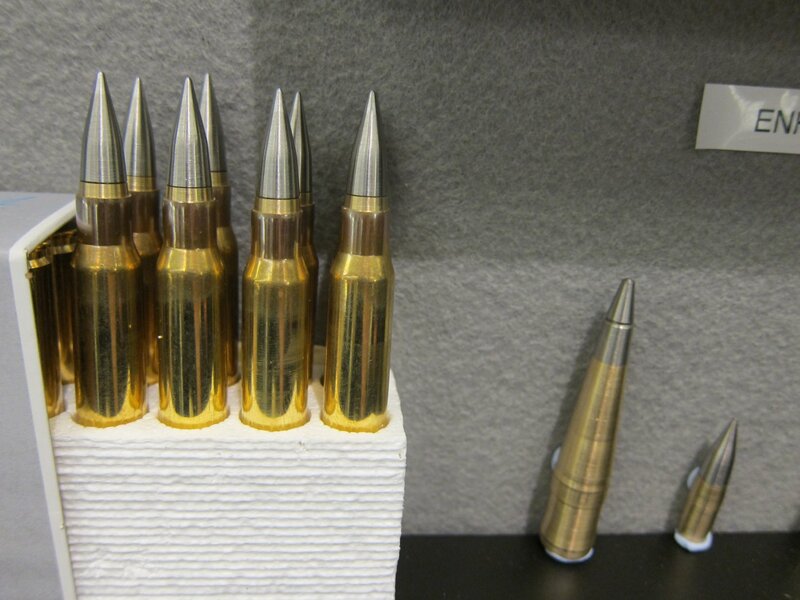 This [7.62mm NATO DSG/PNW SSA SSAP round] will go 1130 meters [1130m], not yards, supersonic. This one [7.62mm NATO DSG/PNW SSA SST solid copper monolithic round] over 1,000 meters [1000m] supersonic," says Richard Morgan. Mark Baciak: Accuracy is normally obtained in the supersonic threshold. Once you go from supersonic, you go transonic, which means you'll start to tumble, and then subsonic, which means that where the round may land is variable. You can't get the precision. 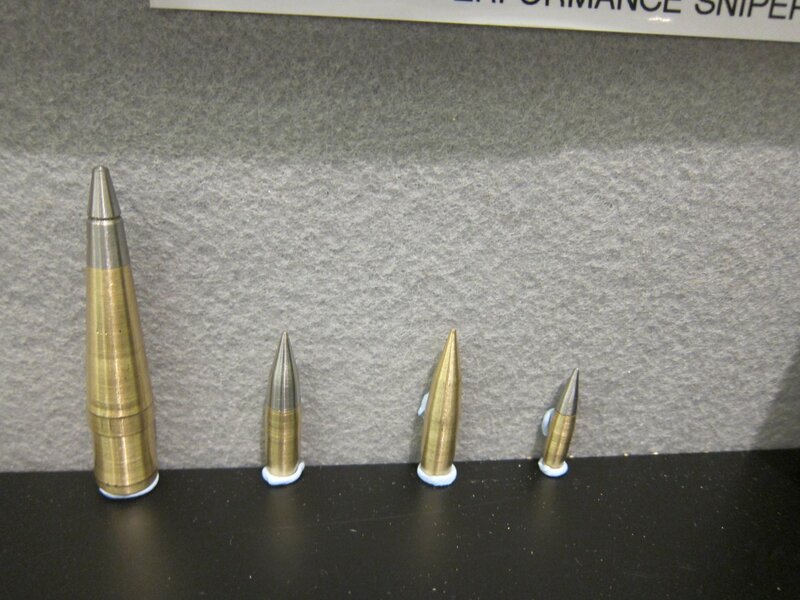 A standard 7.62x51mm [round] can go about 850 meters [850m] supersonic. The varian you’re seeing here [DSG/PNW SSA SST solid-copper monolithic 7.62mm NATO round] goes over 1000 meters [1000m] supersonic with positive effects on target. It’s also really stable in the air and has a limited crosswind component, which means that it’s less effected by crosswinds. Now we look at the other side. 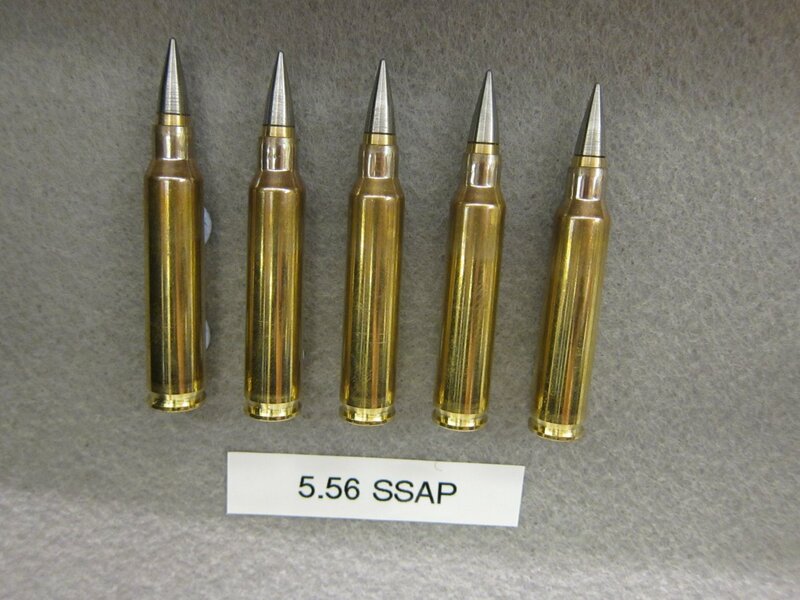 This right here [DSG/PNW SSA SSAP 7.62mm NATO AP round] is the tungsten version. This one will go 1130-plus meters [1130+m] supersonic and have AP [armor-piercing/armor-penetrating] qualities. So, if you’re looking for a high-precision long-range munition in your standard 7.62x51mm gun, there’s no modification needed. It’ll feed in any standard AR-10[-type rifle/carbine] or .308 Win./7.62x51mm platform." David Crane: Is there any pressure different with this round? Crane: Standard pressures. So, this kind of bridges the gap a little bit, maybe, with .300 Win. Mag? Baciak: Yeah, 'cause remember, we're not talking yards. We're talking meters, which is a huge difference. So, typically what we've seen classically happen is you go from .308 to .300 Win Mag. to .338 Lapua. Now, with this new technology, instead of reaching out to, ya' know, a max of 1,000 yards, now you have the capability to reach out 1350+ yards. Crane: Hm. So 1350+? Or 1300+? Baciak: Really, it depends. We actually are coming up with spicier rounds so they can go a little bit further, but let's just say 1300+ yards as a safety. Crane: Very cool. And this is now…is all of this ammunition, both this SSA round and the MEA round, are they both being currently produced, or are they gearing up for production? Baciak: They're currently in production right now. So the DCS and the GPS, which are the MEA rounds, they can actually be purchased today if you put in orders. As far as the Super Sniper Ammunition [SSA], the first runs are going up right now, but they're not going to be available for consumption for probably about another 4-6 weeks, but they're getting ready to start hitting right off the presses, right on the next line.